So I am a huge fan of Dan Brown's books and I had read The Da Vinci Code, way back when it was published in 2003. 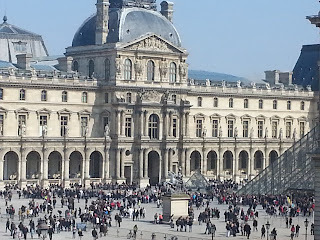 But that is not where I got my initial inspiration to visit the Louvre, although reading the book did its bit to boost my curiosity of the museum and its many famous collections. 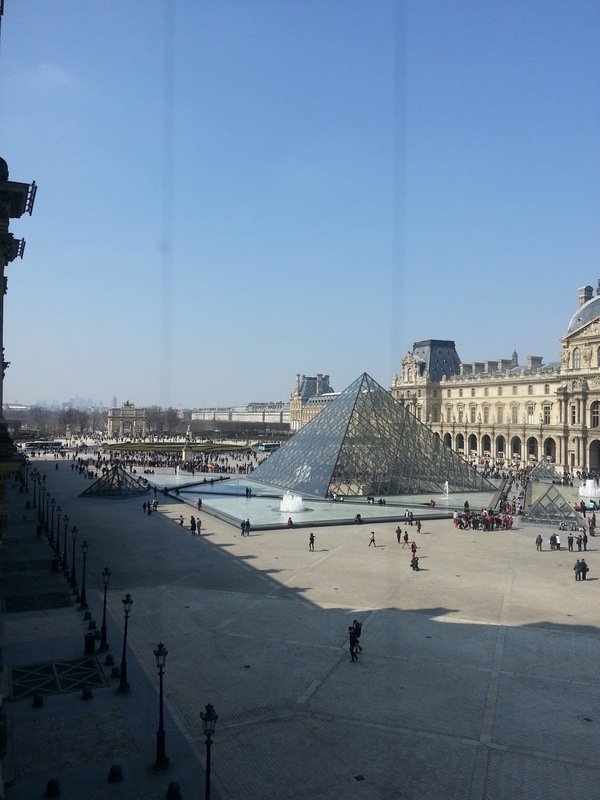 The Louvre was introduced to me in school by some history textbook, which talked in detail about Leonardo da Vinci and his famous painting- Mona Lisa. 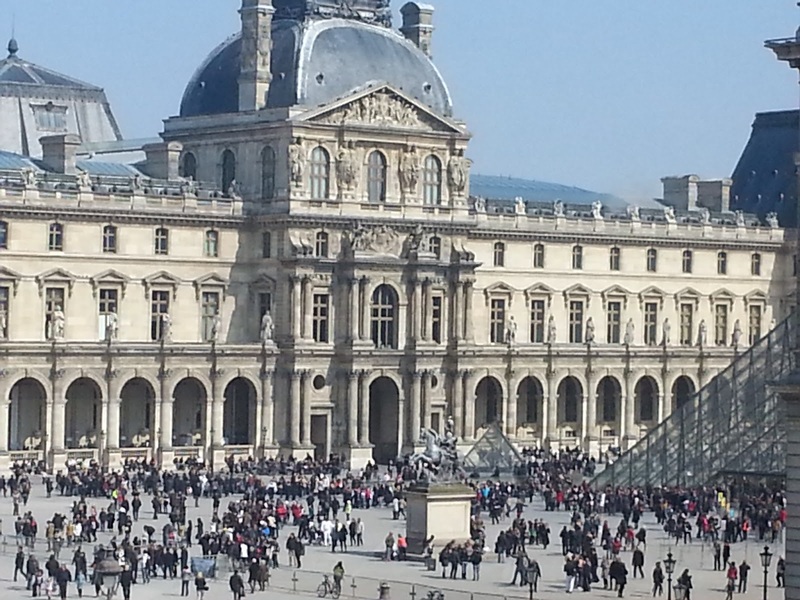 So when in Paris, how could we miss the chance to visit the Louvre and get a glimpse of the madame (Lisa Gherardini)'s portrait, even if it meant to stand in long queues and walk through even longer passages of sculptures, paintings and artifacts. But when I finally got to see the museum, I was more mystified by the place itself- how this huge ancient fortress of the Middle Ages got transformed into the royal residence of King Louis XIV and then later into the magnificent museum that it is today. The museum has a tedious entry system. For those who had bought the tickets earlier, online or otherwise, there was a long queue to enter. For those, who had not thought of buying the tickets beforehand, like us, there was another queue to buy the tickets, so that they can then stand in the first queue I mentioned...confusing and tiring...but then a little wait, to view one of the world's largest museums and the history it offers, is not a very high price, I suppose. 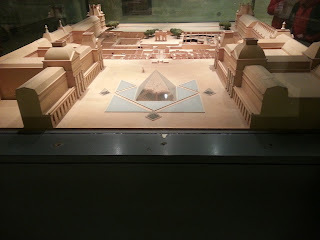 While S stood in the queue to get the tickets, I idled away time clicking models of the Louvre that were on display and stalling the Souvenir shop. Speaking of prices, the entry fee was 11 Euros per person- which I felt was highly reasonable. By the mall entrance of the museum, we could see the famous Inverted Glass Pyramid (remember the concluding chapters of The Da Vinci Code....where Langdon perceived it as the Chalice!!). The tip of this pyramid is suspended above the floor level and almost touches the tip of another small stone pyramid below it. Brown's book is fiction, but one cannot blame him when the view is simply irresistible enough to get creative minds spinning. Once inside the museum buildings, it is like being in a gigantic maze of four levels. The entire structure is like an upturned U- with the glass pyramids in the center of the U. From the main reception area, one can start the tour with any of the 3 wings- Richelieu (houses French, Dutch, Flemish and German paintings, Napolean III's apartments), Denon (home to some exquisite Islamic Art, Italian and Spanish Paintings, European sculptures) or Sully (contains historical treasures from Greece and Egypt, French paintings, Decorative Arts). But before you start, you may want to buy one of the audio guides available at the reception area, just so you don't get lost after a while, like we did once in a while...:). Or like us, you can just pick a map from the reception and follow it....the old fashioned way. After about two hours of appreciating art and history, I was quite tired. And we had not yet seen the Mona Lisa yet. So we continued, till we reached the room that houses this painting. It was interesting, though not surprising, to see the rush, to get a glimpse of Da Vinci's this single painting, when there were a number of his (and other famous artists') paintings on display nearby. 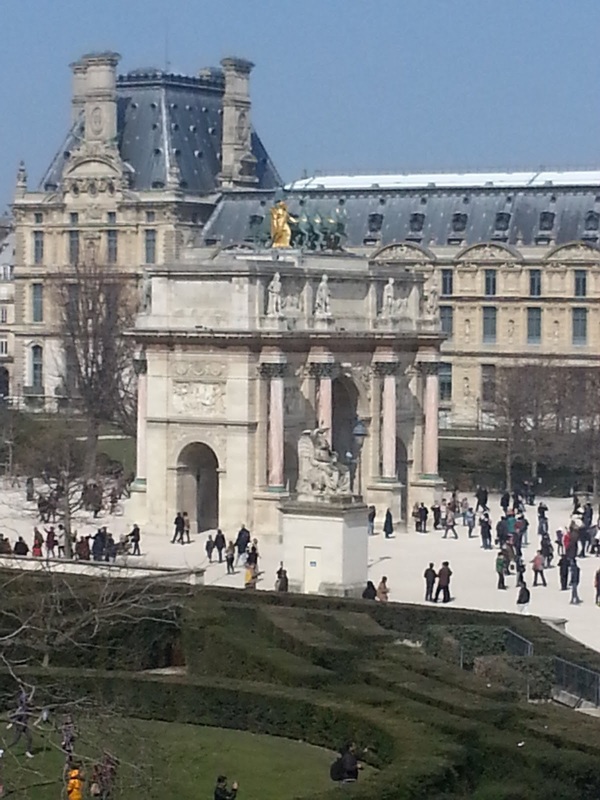 We ended our tour after having a quick lunch at the , followed by a pleasant walk in the Tuileries Garden, but not before we stopped at the Glass Pyramid entrance (in our case, we exited from this door) to click a few photos.